A Christian leader isn’t really a leader but a person who follows Christ (the real leader) closely and organizes others to do the same. 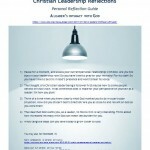 Developing intimacy with God and knowing his heart is the essence of Christian leadership. The Bible is very explicit about how important intimacy with God is for his leaders. This is the danger of letting your personal spiritual life with God coast along, of not giving it top priority over everything else. Saul wanted to do a good thing (seek the LORD’s favour), but he was doing it the wrong way – the king was no priest and had no right to offer the sacrifice. Had he been intimate with the LORD he would have known what to do and what not do. The fact is, I have no right to lead anything that is done in the name of Christ if I am not being directed by Christ! I serve CCCC in the power of the Holy Spirit and in the name of Christ to accomplish the portion of God’s mission that our ministry works on. I’m sure you do the same for your ministry. And while I expect all the staff at CCCC to do exactly the same too, I am quite aware of the higher standard of accountability that leaders have for their obedience to God. The prophets have a lot to say about this! I do my best to practice what I preach, and I have left a ministry leadership role when it became clear I would be doing it in my own strength and power. During my first two years at CCCC, I was also pastor of a small church that had suffered a lot of discouragement and the District wanted me to do four things there as its (part-time) pastor. I loved providing pastoral care for people and I had no lack of vision for what I as their pastor was to do for them. But near the end of my second year, I was praying about which of several priorities should be the focus of my preaching for the next year when the Lord told me my time there was up. I was shocked to say the least! I wanted to stay and I told the Lord so. His response was sobering. “John, you have done everything I wanted you to do there. Well done! I am pleased. You can stay if you want, but from now on you will be on your own.” Oh my goodness! Pastor a church without the Holy Spirit? I couldn’t even begin to imagine that. God obviously had someone else in mind for whatever would come next for this church, and I dared not get in the way. I resigned and helped them link up with a nearby church that provided a pastor. There will be less of a burden for the ministry because it is Christ’s ministry, not theirs, and Christ will look after his own ministries. Only own what is yours to own! Here I must share from my own experience the crushing burden of bearing too much concern for a ministry. Back in the 90s I was a deacon and there were things that were causing significant problems in the church. I felt as a deacon it was my responsibility to fix them. Finally, during a prayer meeting I was overwhelmed with the situation and in despair, when I suddenly found myself crying out over and over again a prophetic word from Jesus. He said through me, “This is MY church, and I will look after MY church. This is not your church, and it is not your problem.” I realized that Jesus is quite competent to do what he wants to do. While I needed to fulfill the responsibility of being a deacon, I had to let Jesus fulfill his responsibility as the owner. Jesus will take care of his own and he only asks me to play the part he has assigned to me. The first act of leadership is to be intimate with God all the time. I’ve written a few suggestions in another post about how to maintain intimacy with God, and in yet another post I wrote about how to hold a personal spiritual retreat. May you truly be able to say with Paul, “But we have the mind of Christ” (2 Corinthians 2:16) Blessings!